Chrissie Zaerpoor, farmer, cheesemaker, up-and-coming mead producer and one of the hardest-working women I know, began Kookoolan Farms in Yamhill with her husband Koorosh in order to build a life and a business together that they could be proud of. Here she reflects on what they've learned about the cycles of life on the farm. "Living in the country" conjures up such a lovely, pastoral image for most of us: fresh, soft mornings, baby animals, the bounty of harvesting from gardens and orchards, the rhythm of daily and seasonal chores, a slower pace and a deeper connection to community, land and food. And indeed the joys of farming encompass all of these experiences. But yin and yang apply to farming, and the joys come with costs. "A deeper connection" implies a deeper intimacy, to the dark and difficult side as well as to the joyous side. Intimacy comes only with a deeper commitment and connection, and that means not turning away from the aspects that we were most sheltered from when we lived in town. Our first cow, Pretty Girl, calved easily; she was an Angus, and it was a little bull calf. Neither animal was particularly tame, and we weren't able to get that close. Several months later, our first dairy cow, Ariba (top photo), calved. Again, it was an easy delivery; it was her fourth calf, and the little female, Shasta, was a beauty. Both mother and baby were very tame. 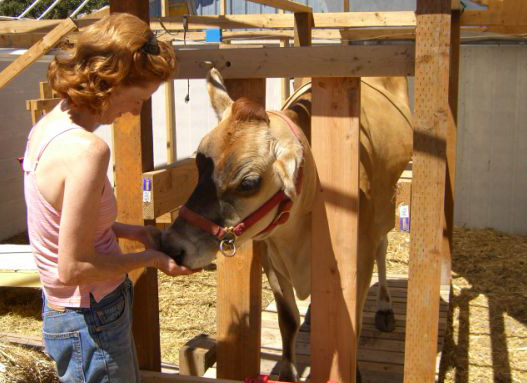 We were in the barn stall when Ariba birthed; we bottle-fed Shasta for weeks. Later, we had difficult births with our goats. Much smaller animals, the young mothers labored to push out their first babies, and the older animals struggled with multiple births. One doe delivered quintuplets. These emergencies force new farmers into the role of midwife or obstetrician; let me tell you that a background in physics or engineering does NOT prepare you for veterinary duties. A neighbor, a customer and I worked hard for five hours on a very cold night to untangle and remove the five babies from the goat's womb; three survived. Our neighbor, a big friendly Italian named Sal Eramo, came right over when I called. He held up a hand the size of a bear paw next to my slender wrist and said, "I can tell you what to do, but you're going to have to do this yourself, capiche?" A year later Sal called and asked for Chrissie's small arms to help deliver lambs from a ewe who was having trouble. A box of day-old baby chicks is the cutest thing in the world. A box of baby chicks that was on a cart not properly strapped into the mail service truck containing a dozen or so mashed, bruised and dismembered bodies is not. Barn cat kittens, born in the chickens' nest boxes and partially-reared by hens, were the cutest things in the world. Mature cats preying upon a brooder full of day-old chicks as though it were an arcade game at a county fair, was a dreadful massacre to behold. In fact, chickens open up a whole world of predator-prey relationships that we were blissfully ignorant of in town. We have learned to identify the predator by the calling card it leaves behind: owls peck a hole in the top of the chicken's skull; skunks eat just the head and gullet; cats eat all the internal organs and sometimes the flesh meats; raccoons drag their prey down to the creek where they can wash it in the water. Coyotes take the whole carcass, whether it's a chicken or a lamb, and leave not a trace behind. Learning to identify who's taking the chickens is crucial for beginning farmers who are just learning how to have the stomach to fight back.